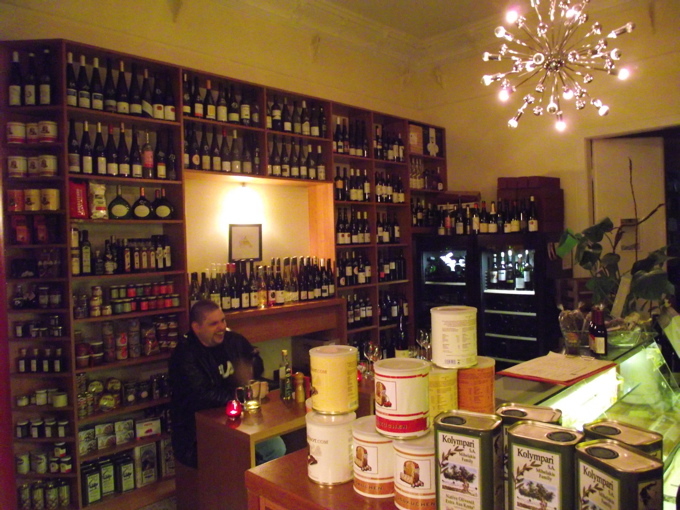 Before Hammers’ Weinkostbar opened in 2007 as a purveyor of wine and sundries, the location was a butcher shop. An 80 year-old “Fleischerei” sign still hangs above the door and, apart from adding a little of that Kreuzberg character to the place, it also seems to suggest that when you enter Hammer’s you are to treat it like a respectable neighborhood butchers. This may seem out of place for a wine-bar, but Hammers, like your local butcher, doesn’t want to be considered fancy. Instead, it would like local residents to view it as an easy place to drop in, have a chat, a glass of wine and a little snack. The Hammers motto is “Unkompliziert und Kompetent,” or, “Uncomplicated and Competent.” And if they served beer, this model would be simple for Berliners to understand. The city is chock full of cozy little bars where you can stop in at the end of your work day, sidle up to your usual table, and leisurely enjoy a pint and the evening paper before heading home. But wine—no matter how easy it is to access, and no matter how cheap—still carries connotations of wealth and social snobbery. Enter Jurgen Hammer in his Levis, work boots and zip-up sweater. He looks as far from snobby as one can get and that look, along with his very casual approach to customers, immediately puts people at ease. I entered the bar on a Monday at 6 p.m. and was greeted by Jurgen, his wife and business partner Manuela, and the gruff crooning of Johnny Cash. I felt immediately as if I’d found my bar. One of the best things about Hammers is their selection of Spatburgunder, which translates directly to “Late Burgundy” but which is more famously referred to as Pinot Noir. The bar sells t-shirts emblazoned with the message, “es ist nie so früh für spätburgunder,” or “it is never to early for Late Burgundy,” and they even sell a house-blended Frühburgunder, a close cousin to Pinot Noir, which ripens earlier than the classic varietal. I drank a glass of the 2008 Hammer’s Frühburgunder Trocken Gutsabfullung, which was grown in the Nahe region and then blended by Jurgen Hammer himself. The result is just stupendous table wine, a term that I’m sure connotes lesser quality, but which I am using to denote a preferred daily wine. I drank a glass along with a little Wurststulle (a simple sausage sandwich on brown bread with lots of spicy mustard). 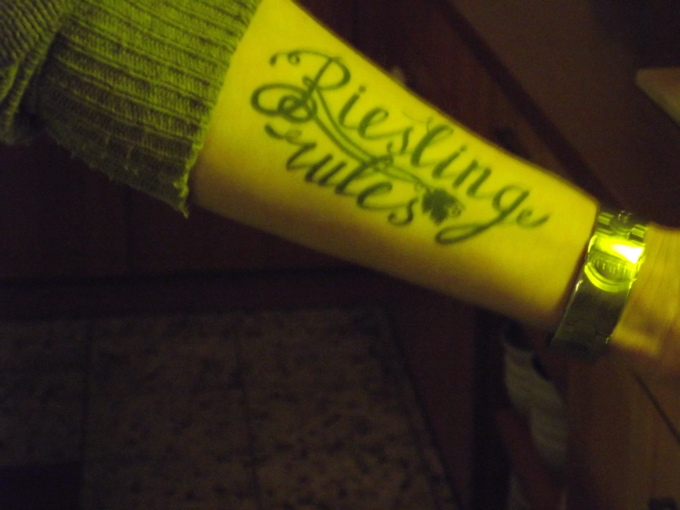 That a man like Jurgen Hammer—who sports a large tattoo with the words “Riesling Rules” on his right arm—should become a player in the German wine scene, is a testament to the wine revolution taking place in this country. This year, Jurgen will become the director of the Berlin branch of the German wine and Sommelier school (Hammer@weinschule-b.com) and I’m sure his approach, though no less knowledgeable, will differ greatly from his predecessors.